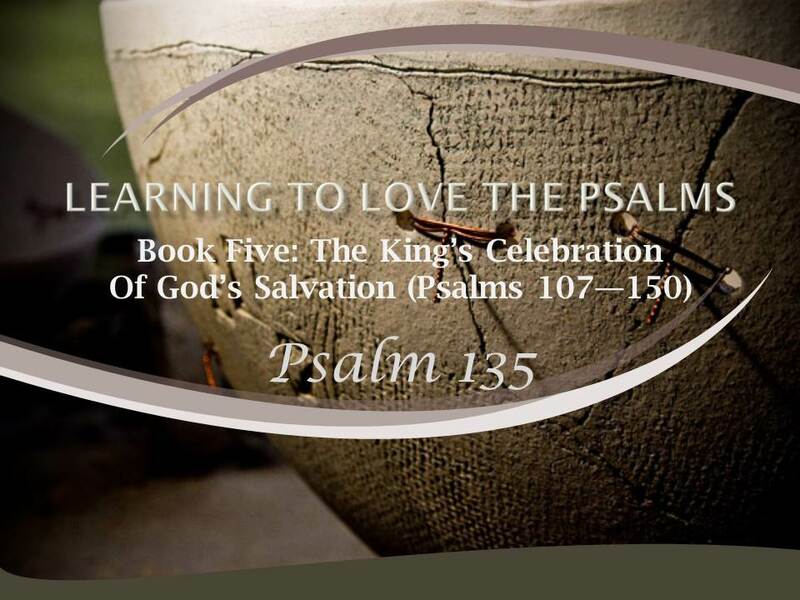 Psalm 135 is the first in a group of three psalms that primarily focus on the enemies of God’s people. Still, Psalm 135 is an appropriate psalm to follow the songs of ascents. The pilgrim journey to Jerusalem culminated in the call of Psalm 134:2: “Lift up your hands to the holy place and bless the Lord!” Now, in Psalm 135, the psalmist stands in the temple, calling on temple workers as well as the priests and Levites to join the king and people in praise. This psalm, too, begins and ends with sections that call the servants of the Lord to praise him, (vv. 1-2, 19-21). The intimate fellowship of God and his people in the temple is expressed in verse 21: “Blessed be the Lord from Zion, he who dwells in Jerusalem!” Praise arises to God from the people of Zion who are also his habitation. Three themes dominate the praise of this psalm. First, God is good in the election of his people. Second, God is great and strong, as we see in his creating and redeeming work. Third, God is superior to the gods of the nations. This good, great, superior God is the God we know in Jesus Christ. In Jesus, we see the victory of God for his people. First, then, the praise of this psalm focuses on the goodness of God: “Praise the Lord, for the Lord is good,” (v. 3a). He is good especially in his kindness to his people. It was from his goodness that the Lord chose Israel out of all the nations of the world to be his covenant people: “For the Lord has chosen Jacob for himself, Israel as his own possession,” (v. 4). After introducing the goodness of God, the psalm illustrates that goodness in terms of his greatness and power for his own people. Verse 5 presents the second and third themes that dominate most of the rest of the psalm: “I know that the Lord is great, and that our Lord is above all gods.” The next verses then present the greatness of God, (vv. 6-14), followed by verses contrasting the true God with the idols of the nations, (vv. 15-18). The psalmist praises the greatness of the Lord in terms of two areas of his activity: creation and redemption. God is great in creation. He is supreme over all creation. He is not part of it or controlled by it. Rather, he controls it absolutely: “Whatever the Lord pleases, he does, in Heaven and on the Earth, in the seas and all deeps,” (v. 6). Specifically, this psalm sees God as the One who determines the weather: clouds, rain, lightning, and wind all serve his will. We know about God’s creation and about his victory over Pharaoh, but what do we know about Sihon and Og? Most Christians probably know little or nothing about them. They were kings who opposed the entrance of Israel into the Promised Land. Their attack on Israel and their defeat are recorded in Numbers 21:21-35 and Deuteronomy 2:24 – 3:11. They are of particular importance to Israel’s history because their conquered lands became part of the Land of Promise (see Numbers 32:33; Deuteronomy 3:12-14). So Psalm 135 and 136 praise God for the victory and the land that he gave his people in the defeat of these two kings. Psalm 135 and 136 are again similar to Psalm 83 in citing relatively obscure events of Old Testament history as part of the praise of God. In Psalm 83, Israel remembers a host of enemies from different periods of history, but all the enemies had a common goal: “They lay crafty plans against your people; they consult together against your treasured ones. They say, ‘Come, let us wipe them out as a nation; let the name of Israel be remembered no more!’” (Psalm 83:3-4) These enemies say, “Let us take possession for ourselves of the pastures of God,” (v. 12). Similarly, Sihon and Og wanted to destroy the people of God. The God who delivered Israel from Egypt and from Sihon and Og in the past will continue to preserve his people. As God’s people derive comfort and strength by remembering the past, they can face the future with confidence: “Your name, O Lord, endures forever, your renown, O Lord, throughout all ages. For the Lord will vindicate his people and have compassion on his servants,” (Psalm 135:13-14). As Christians, we may ask whether we should be concerned about these events and nations that have long disappeared. Part of the answer to that question, as we have seen throughout our study of the Psalms, is that the church of Jesus Christ is the Israel of God. Old Testament history is our history. The spiritual reality of enemies that seek to devour us is as true for Christians today as it was for Israel in the days of Sihon and Og. This history is indeed significant for us. Psalm 135 in its third theme contrasts the good and great God with the idols of the nations. It shows that God is superior to the gods of the nations. The idols are made of elements of the Earth by the hands of men, (v. 15), whereas the true God is the maker of all. The idols are chosen and fashioned by the nations whereas the true God chooses and forms his people. The idols cannot speak, (v. 16a), but the true God calls creation into being by the word of his mouth. The idols cannot see, (v. 16b), but the true God saw the blood of the Passover and spared his people. The idols cannot hear, (v. 17a), but the true God heard the prayers of his own for deliverance. The idols are lifeless, (v. 17b), but the true God is life-giving. Those who worship idols will become like them, powerless and lifeless, (v. 18), but those who worship the living God will receive eternal life from him. This psalm praises God for his goodness and his greatness. It begins with five calls to praise the Lord and ends with six calls to praise. Here is a God whose works we should study and remember. Here indeed is a God worthy of all praise. What three themes dominate the praise of this psalm? What does the psalmist have to say about God’s creation and redemption? As Christians, should we be concerned about the events and nations of long ago that are mentioned in Psalm 135? Why or why not? How does Psalm 135 contrast the great God with the idols of the nations? Do these same idols exist in our culture? Do they or similar idols exist in the church today?